Thnx!! Mukesh for providing the code. I am trying to integrate this and your blog help a lot. In my blog i am sharing the ful running code, pls go through the downloaded link. I dont seem to find the code. Please could you give a link. Thanks. I dont seem to find the source on your blog. Please help with link. I am new to android and needing help with QR. Thank you. Have you knowledge about geo fence concepts in google map in android.if yes means please share your knowledge..
yeah i tried in same last project that time my client was saying astonish condition to using Zxing lib, there is any way feel like own app.. Yes there is a way..I will help you more if you share your code or view. First of all thank you for an updated tutorial about ZXing library. I downloaded your code, create the file code.jar and add it to the 2 packages I downloaded from you. I changed the Java Compiler to 1.6 to remove all the errors. I created the apk file, installed it and when I submited there is a error and appearded a forced close. Do you know the reason? I am also face this issue when ,I am trying to embedded the zxing library. In my case , I am getting class not found error. This , happen because , I missed to add core.jar into build path.But after adding it reference into my build path ,Its worked. I don't know whats wrong in your case , but if you share your error detail i.e log cat detail , then probably o will solved your problem. I saved code.jar into libs folder from com.google.zxing.client.android.PreferencesActivity and then add it into the build path, create the apk file and it work now!! on the basis of "String capturedQrValue" ?? If yes, In my code, I am already fetching the "String capturedQrValue" , in onActivityResult. You just put new intent to open new class inside the onActivityResult.Just after where ,I am fetching the "String capturedQrValue" from intent. Feel, free to ask ,If I am wrong. i have imported your project into eclipse gives no errors but when i run and click on submit button the application stops unexpectedly so can u suggest something..
Will you provide me the log cat error which occurs in your case. I thinks you are facing the class not found error and your app is going to be force closed....Right ?? If this is the error please read the conversation B/W me and Ivan. Do you know where the source code is located in the CaptureActivity message that displays the results of the scan. 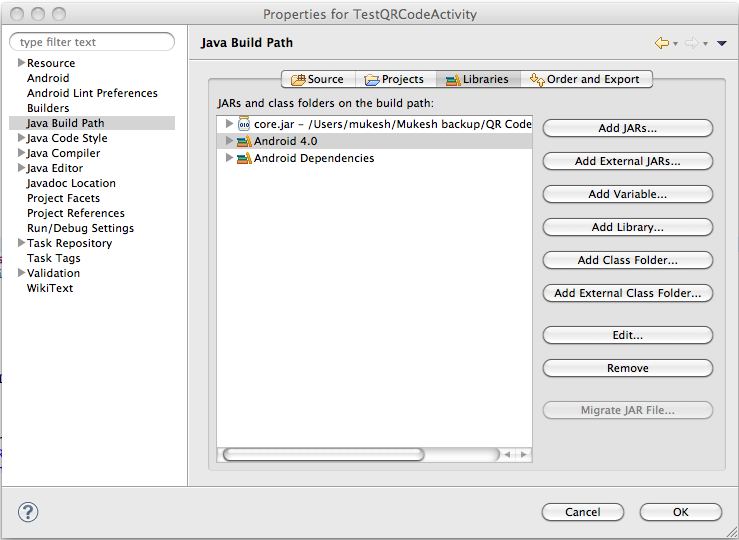 Because that would set the TextView results in TestQRCodeActivity? If you scan a valid qr code then the scan result will be handle inside the onActivityResult(int requestCode, int resultCode, Intent intent). The toast display the qr code value. Inside the lib project there is class "CaptureActivity" In which I am putting the value in bundle. 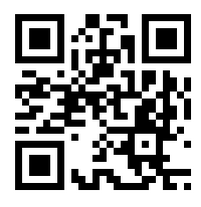 Sure, soon I will upload an video tutorial link of Qr code integration. In B/w if you have query|problem regarding the integration of above code please let me konow...what it is ?? 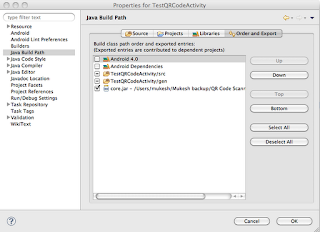 With this blog I already provided the full working source code , you just need to download it and import it in your IDE. I have been searching internet for zxing integration into an existing android application but I could not find a complete tutorial upto yours. I really appreciate your work, with one word it is fabulous! I tried to download the code but the zip file does not exist. Could you check it please. The file is not there apparently, would be a massive help if you could resolve this :)! Thank you in advance ;)! Hello Haris, In your case I think you are not adding the core.jar library in your application build path... So Its giving you ClassNotFoundExceprion . Clean your project and try it. I am doing the same and Its working at my end. Have you added the core.jar as a library in the zxing project? Hello Peter, in your case you are not adding the core.jar in your build path due to this your sec folder showing the lote of error. Add the core.jar in your project build path and clean build your project....Hope it fix. first of all I would like to thank you for the great tutorial. Could you please tell me if the application above is a stand alone app or does it call the barcode scanner found on the phone? No need of barcode scanner app, this application uses zxing as a library project which open a camera by calling the Intent and scan your qr code. Appreciate if you can provide me full source code. I am not able to download it here. Great tutorial. I could not find anywhere a simpler and complete tutorial for zxing qr code integration. Thank you. because you are not adding the core.jar library project in your build path. 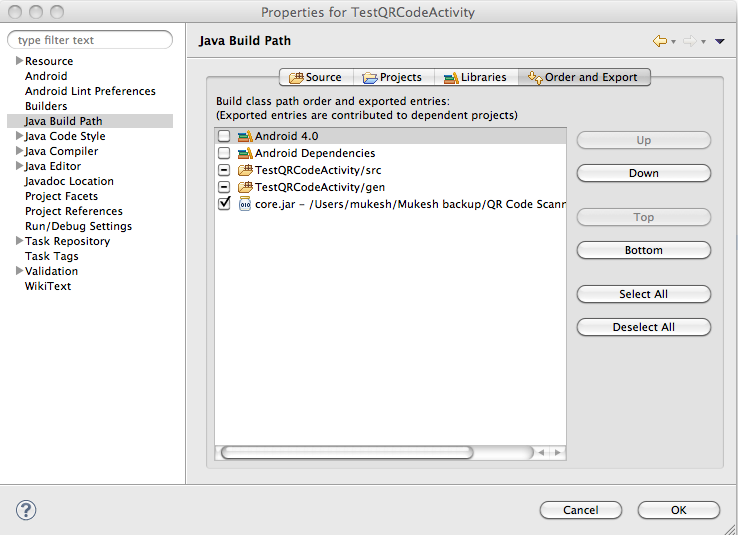 Try to add it in your build path and then clean your app and reun it. Thanks for the blog its really great. However, I am facing a problem. I don't have any errors and after I click the button the app is crashing. I think the crash is because of the configuration issue.There are two reason 1. Your application can't find the capture activity class. 2. You are missing something during configuration of zxing library. But until and unless If you not provide me any log cat or error I can't help you more. Please find below the error any help ? Hi, Your application didn't find the CaptureActivity class. This is a configuration issue please provide the right package name and also rememeber to add zxing lib in your build . Otherwise it give you CaptureActivity class not found error and also package name error under which your CaptureActivity class has been placed. but I get options once the scanning is done I just want to view the QR code in a text view. Once i read the code , in my screen appears 3 options:1) Send via sms , 2)share via e-mail and the last one , 3)search on the web. I want the read input go directly to my textview and not sshowing these options i am mentioning now.Could you help? It seems to me that the function onActivityResult is never accessed. You have to fetch this data on your onActivityResult() method and there you can set it to textview. 1. Calling the intent as startActivityForResult() as I am doing in above code. This helps you in both calling the onActivity method and also show the QR code on a text view. I got the following Runtime Exception. Do you have any idea, whats wrong here? Would be great, if you would have any proposal! i got following Runtime error after clicking SCAN button..
and i did all u above suggested solution !! 2. 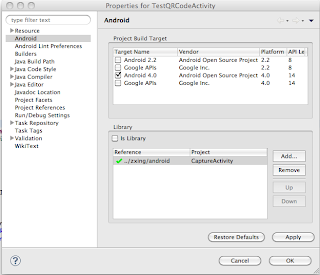 Also cross check once again for the activity class declaration in your androidmanifest.xml . Thanks a lot Mukesh! Great one! I have provided all links and code in my blog please go step by step , I don't think you faced any issue in the integration of QR code. If you have any query or problem feel free to ask. This happens when youe lib project is not configure correctly ,and your class not find any claas or package i.e com.google.zxing.ResultMetadata in your case. I changed my code. Now I am using intentintegrator and intentresult. And my code is working. But I must link to barcode scanner app from my web server. How to do it? This tutorial is by far the best among others which i referred on internet which can be easily understood. Am facing the same error " com.google.zxing.ResultMetadata" class not found error. I have built the core.jar and included in BiuldPath and imported few classes as well which detected core.jar. hi there, i really loved your post here. my name is Salman, and i am an undergraduate currently doing my final year project which deals with designing a qrcode scanner as part of the project. what i intend to have is a scanner that will read a code and only direct you to a link that is preconfigured on the app, and will block redirecting to any other link. i have no knowledge of android development, and i was really hoping you will help me acomplish this. my email is techoctober@gmail.com, anticipating your response thanks. replace the code where I am showing the toast message with the webview . Thank you so much for this tutorial. At first I wasn't able to get onActivityResult to kick off, but I read through the comments and found your solution. As we are incorporating the core into the project we don't have to worry about the rest of handleDecode since we are returning the result to our activity. For others benefit my handleDecode method in CaptureActivity now only contains this and returns to my onActivityResult() method. I have not run this code with fragment so I am not sure about the problem you are facing. I think this will happen when you calling onActivityForResult() and get the the result. Please check where you setting the data in bundle and returning it to your calling activity. hey mukesh...this code is giving run time error(unable to startactivity CaptureActivity)...can u pls help me? 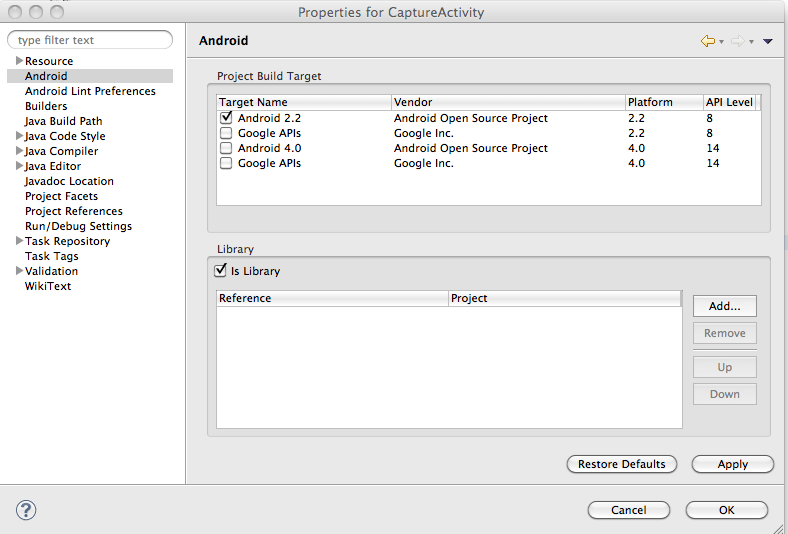 Have you added the CaptureActivity in Androidmanifest.xml?? Please provide some more logs so can I help you. how to solve above error? Your application not able to find the location of CaptureActivity.class. Please check the androidmanifest.xml file and also cross check that core.jar lib is added properly. Please add your jar in your project build path. hi mukesh. thanks for this tutorial.. I am an undergraduate student. I got toast on method onActivityResult not show after scanning the QR code, how I can resolve this problem? In the above example I am having trouble in Step 2. Kindly guide me in creating core.jar. Your blog post was very helpful for my project. thank you. Im just trying the tutorial above but its not working. Could you please send me the full source code of the QR Code Scanner. Can You please share core.jar. Hi Please can you share your core.jar file? As I cant seem to build one with your initial steps and the version from Maven doesnt seem to include the CaptureActivity class. Can you email the zip file to my email? Hi .. i have problem in get core.jar file, i can't able to create that, can u please share your code with core.jar file.. I got some error in Zxing library project.. can u share me the code..
but the size of application which only contain the scanner exceeds 2MB is there anyway to reduce this file size? can you please send me the complete code. I tried copying core.jar downloaded from Maven website in to my Android App's libs/ folder. I can see this getting included in Java Build Path as well. There is no compilation error around here. However, when I launch my app where I am starting the Scanner activity via Intent, I am still prompted to download Barcode Scanner application. I am looking for a "third-party-application-free" solution where user should not be required to download another application to use my app feature. Just copying core.jar is not helping. Can you please advise here what I am missing out? Thanks! Thanks for your support, but I am stuck on 2nd step because I am not familiar with "apache ant", thats why I can't create core.jar file. Please explain 2nd step in brief. Hi Mukesh I did Same Way but while producing .apk file I am getting error like "[2013-10-02 09:26:44 - QRCODE] D:\CDAC\QR READER\ZXing-2.2\zxing-2.2\android\res\xml\preferences.xml:84: error: Error: No resource found that matches the given name (at 'entries' with value '@array/country_codes'). [2013-10-02 09:26:44 - QRCODE] D:\CDAC\QR READER\ZXing-2.2\zxing-2.2\android\res\xml\preferences.xml:84: error: Error: No resource found that matches the given name (at 'entryValues' with value '@array/country_codes')." I'm experiencing a problem, when I run the build.xml file using command prompt to generate the core.jar file, I do not get the jar file, instead I get another zipped zxing folder with another build.xml file.. Thanks so much Adam Bannach!!!! Spent a whole day on this. Oh and thanks a lot Mukesh too! Thank you very much for the code, I want vertical orientation of camera while reading bar-code, can you please help me. Change the android:screenOrientation="Portrait" in AndroidManifest.xml file. Yes, agree this is a small issue I too faced while doing my scanner app.I go through some forum but they too suggest to use "landscape" for better performance.That's why I am using in landscape mode. May be in the latest zxing lib code they will be fixed this issue also...not sure. IF u only want to scan bar code then use "BarcodeScanner". The above one is work for both barcode as well as qr code scanner. Hello Mukesh, I'm having some troubles adding the zxing library. The folder Core no longer contains a build.xml, so I've tried downloading a new one from the Zxing website. After following the tutorial, Eclipse isn't able to find the package com.google.zxing and therefore the CaptureActivity class. Hello Victor, Please clean your project and then try it. Seems that the problem was that the core.jar wasn't in my /lib. After I moved it, the code error was gone. Now I'm trying to execute the app in the emulator. Thank you for your time Mukesh, and for your dedication! Can u send me the source code as I no longer can see the scanner.zip? Hi I'm new to android programming, I want to make an android app which reads a QR code with the phone camera and fetch the data from the QR code on reading it. how do I go forward with it? 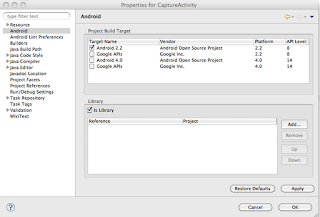 And while compiling it, on Console window it shows :"CaptureActivity] Could not find CaptureActivity.apk!". Could you tell me what is it mean ? Hi..Great Tutorial, but I have a little problem. I include the library correctly but I can't manage the result. 2) manage the content of the scan without the classic choose ("search via internet", "send via sms", etc). I whould scan and manage the result. Can I do this? Can u send me the source code to my email account?? Because i cant download ur source code. Could you please send the zip file to me as well? qr code scanner must work very fast and get result less then 2sec. 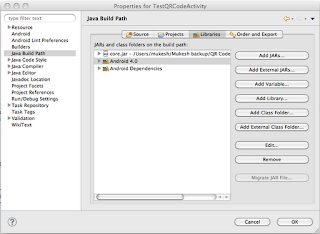 if any one have ideas about QRcode reader on java. i need some one help to integration of QRcode reader. I just need QR Scanner so can u please mail me the QR Code Scanner Source code on my mail ID- karishmapkale@gmail.com..?? Could you send me the code, please? Can you please email me full source code of your app? I really need it on my project. Nice tutorial.I am not able to download source code .Please mail me the code for qr scanner. Nice tutorial.Please mail me the code for qr scanner . Please can you send me too the code at jegathaaa@gmail.com? Can you send me the source code to my email account. Much Thanks. Hi, I don't understand why the same coding is scanning only barcodes for me and not QR codes. Hi Mukesh! Would you be kind to send me the code for the QR scanner too, please? Sorry for the trouble and thank you for your article! want to have a change, please email me source code. will test it until i use it. Hi MuKesh, I am getting this exception. Please have a look. I am running at my end its working fine, can you please drop me your code so that I debug it and rectify it. Please share your code with me at kmbuco@gmail.com.Regards. Buildfile: core\build.xml does not exist! please let me know if you still facing the issue. @mukesh, no words to thanks u. u saved my job. I pleased to have ur reply! now I am trying to make android project from zxing svn as Library to add it as module in my project. I am doing this all in Android studio.even I did it but that android project has many classes and it seems some are unused and apk becomes max size. possibly I just want scanning QR functions only. so I appreciate your support to do this. hope u will assist as I have seen lots of thread comments in your blog that shows you always help us. When i pass intent to CaptureActivity, always open the back(secondry camera) camera, can you plz tell me how can i open the fron camera in this code. plz tell me, i am stuck with this. I read the article. found it very helpful. I think it is for eclipse. 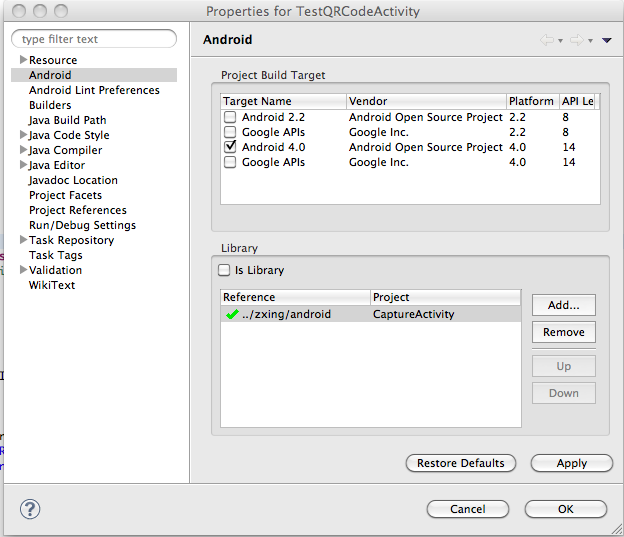 Can you please share the project for android studio.. i am new to android..
By far the best tutorial out there! Great work!! Thank you for the brilliant work! Could you please send me the code at byronova@gmail.com? PS: Is there a way to adapt this for android studio?